Matthew and I have decided to do a business trip to Glasgow, though we do have ulterior motives...we have tickets to watch Arsenal play Celtic that night at Celtic Park, in a Champions league qualifier. 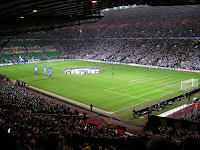 We're both avid Arsenal fans and we saw this as a great opportunity to visit Glasgow and take in what should be a terrific Champions league game with an electric atmosphere which is synonymous with European games at Celtic Park. We are going to be at the Regus Business Centre, from 1pm till 5pm & have a wide selection of cloths, including a new range of exciting tweeds & cashmere.